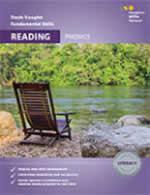 Journey to Success is a reading and writing program designed for high school and adult learners. The student books and accompanying teacher' s guides represent research-based principles and best teaching practices. 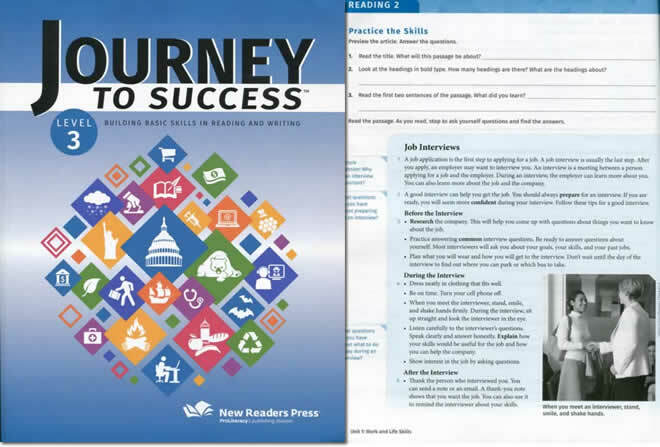 Journey to Success develops explicit connections between reading in the content areas, vocabulary, writing, speaking and listening, and language instructions as suggested by the College and Career Readiness Standards for Adult Education. 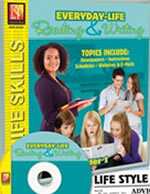 Each student book is divided into four units: Work and Life Skills; Social Studies; Science; and Literature. Each unit contains three 10-page lessons and a unit review. 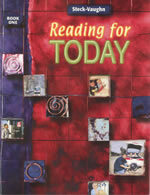 Students work with authentic reading selections that include practical, informational, and literary texts. Writing assignments reflect real-world and academic activities that draw on elements of the readings. In Journey to Success, students work independently and collaboratively. Many activities allow students to discuss ideas and share responses, providing opportunities for speaking and listening practice. Extension activities in each lesson encourage students to research topics, analyze information, and apply skills to new situations. Students engage in group discussions, responds to stimuli such as quotations and photographs, and connect the lesson' s content to real-world scenarios. Students draw on their knowledge and life experiences and learn how the readings are relevant beyond the classroom. Answer Keys at the back of student books allow students to monitor their progress and work at an individual pace.